Today we took our boys on their first trip to the Arnold Arboretum of Harvard University. This is a beautiful 265-acre park located right in Boston, filled with a variety of paved and dirt paths that take you through huge groups of rhododendrons, roses, azaleas, birch trees, cherry trees, and many other types of plants. Although our trip today was only about two hours, a trip to the Arboretum could easily be made into an all-day event. For those looking for an easy stroll, there are paved roads (with little to no car traffic) that run throughout the park. Off of those roads run wide dirt paths that are still a fairly easy walk, but tend to be a bit more hilly. Off of those paths shoot even more dirt paths, more narrow with a much less smooth terrain. 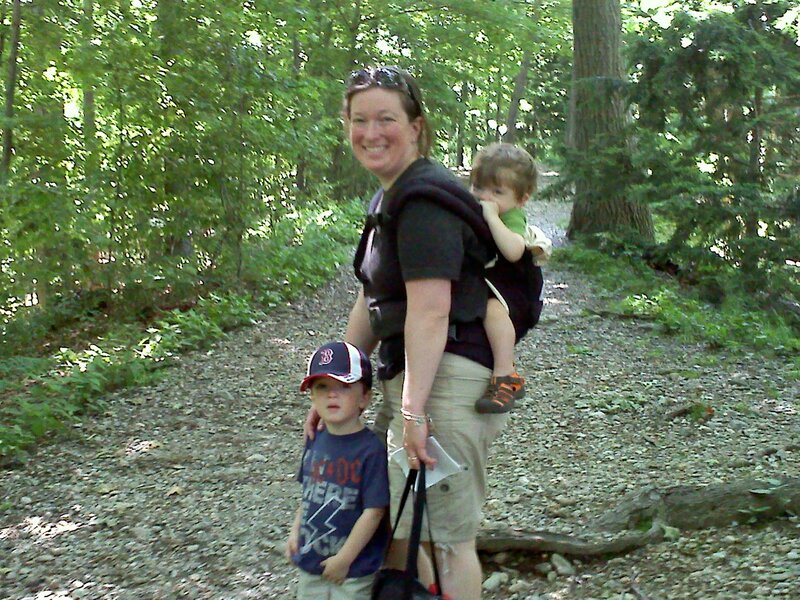 Eamon made today’s trip in our Ergo carrier and Finn walked (and occasionally asked to be carried for a few minutes). We couldn’t remember from our last trip there (probably about four or five years ago) if a stroller or wagon would be more of a hindrance than a help, so we didn’t bring one. For future trips, I would probably consider bringing one or the other, just so that Mike and I could get in a good, long walk and the kids could hop in or out along the way. Due to kids sleeping in this morning (YAY!) and an early morning car service appointment, we didn’t have time to make a picnic lunch this morning, but we’ll definitely be bringing one on our next trip back. There aren’t any picnic areas per se, but there are more than enough shady areas to lay down a blanket, relax for a while, and enjoy lunch. 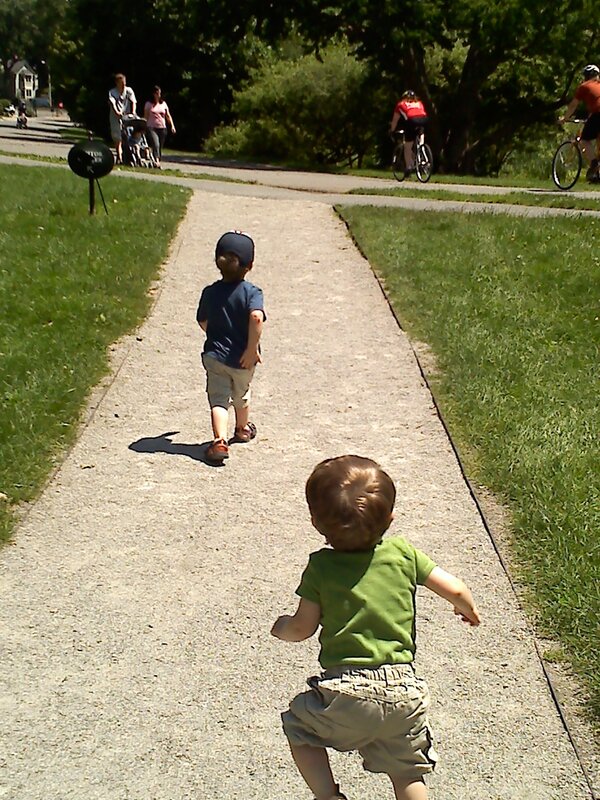 Finn and Eamon loved the chance just to be outside, run around, and get some fresh air. We pointed out different animals, named some of the different plants, and explained a bit about how maps work – little of that will probably stick, but if even one little bit does, it’s something. And even if not, the fresh air and family time are enough. There are many different educational activities at the park, including Family Drop-In Saturdays on the last Saturday of the month April through October, Living Museum or Science Lab backpacks available to borrow for families whose kids are over the age of three, and Arboretum Interpreters posted around the park on select days to educate and inform visitors. I would highly recommend Arnold Arboretum as a place for some family fun. I know we’ll be heading back often this summer! I have not been there in years. Will have to go. Thx for the reminder.